What to consider and how to make the most of this choice. Commuter students are sometimes criticized for not taking part in the “real college experience.” To find out the truth, I unscientifically surveyed a few commuter students and learned that, like most things in life, the experience is what you make of it. Here are some points to cover when discussing this option with your teenager. Cost The kids I talked to said a key reason they chose to commute was to save money. Room and board can cost an additional $10,000 or more depending upon the college. One student explained commuting left her money for grad school. Another said he was able to graduate without any student loans. They did point out that when figuring out actual college costs, make sure to factor in transportation, because that can add up—buying or leasing a car plus insurance and gas, or bus or train fare. Flexibility Commuting allows a student to keep a job they like, or one that can help them pay for college. My own kids who live at college have lost out on off-campus jobs near their schools because they’re not available to work during breaks. Living at home allows a student to stay involved in their community, too. More time to spend with family and friends Commuters can more easily stay in touch with their local friends and be around for family events. As one student told me, you can go to your chemistry class in the morning and be at your sibling’s ball game in the afternoon. Plus, home-cooked meals are a definite plus. Privacy Living at home means you don’t have to deal with getting a “bad” roommate, trying to study in a loud dorm or sharing space. A couple of kids said studying at home in a quiet, familiar place was important to them. Commuter students don’t need to pack up their key possessions to move into a dorm room with one or more roommates. Time management Another big advantage of commuting, according to the students I surveyed, is development of their time management skills, which they considered important real world experience. Their lives require serious scheduling because they have to allot time for travel to and from school, and account for inclement weather, traffic jams and other transportation issues. As one said, she couldn’t just roll out of bed and walk across campus to class. They also need to make the most of their time on campus since getting back and forth isn’t as easy as it is for students who live there. Living a double life The commuting experience is enhanced when a student can spend plenty of time on campus and still take advantage of living at home. Not all the kids I talked to felt they were able to be as much a part of campus life as they would’ve liked. 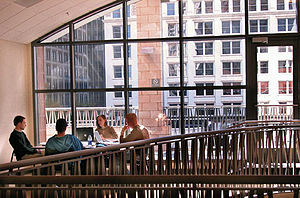 To make the most of their time on campus, commuter students need to learn about what the school has to offer, including programs specific to them. One student recommended studying at the library, working out at the campus gym, eating in the dining hall, whether for a meal or snack, and getting involved in an extra-curricular activity or two. Basically, spend time on campus outside of class and find ways to socialize with other students. But that’s not always possible for a student who needs to get to a job as soon as their last class is done, or who’s dependent upon a train or bus schedule. Those students find it harder to become more active on campus. Weigh the options If your student is seriously considering commuting, help them review the pros and cons, including many of the factors I mentioned above. All the commuter students said this is important before making a final decision. They see the choice as an individual one. I’d also suggest your teen talks to current college students to gain a better understanding of the commuting experience. Special thanks to Jose Bautista, Alexa Greto and Marissa Ruggiero for their help with this post. Please share your thoughts and experiences on commuting to college in the comments section below.